Make friends using simple inflatable robotics. The world of inflatable robotics, or soft robotics, is fascinating. Soft robotics uses fleshy materials like an elastomer, constructed with or without channels, that act as actuators hooked up to dynamic pneumatic control devices like the one shown below. This technology is changing the way we think about solving mobility problems such as gripping, walking, crawling, jumping and exploring. The possibilities for air-controlled exoskeletons to help patients suffering from muscle and skeletal disorders are wonderfully promising. I wanted to use the simplicity of the design in this field to introduce a new or younger generation of makers to sensing and exploring the world of electronics affordably with Inflatable Friends. So, here's my first crack at it. 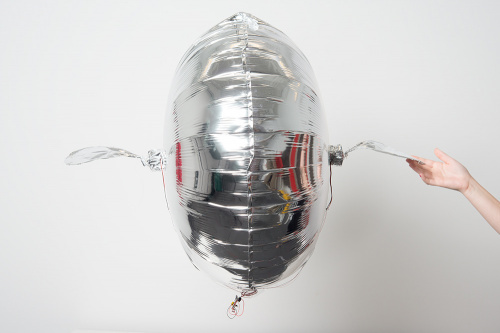 Fin is the original creation of Pritika Nilaratna and based on her work "Ollie, the robotic blimp". Please check out her site and feel free to share under a Attribution-ShareAlike 3.0 Unported License"
This is Fin, the Electret Blimp. This project takes sound reactivity to a new level. No LEDs here! Check out the full tutorial, his origin story and see him in action here. Fin will flap his fins wildly with excitement when he hears you. He does seem a little mopey when there isn't much going on. His blank slate appearance allows you to project a personality onto him, or you can decorate him (keep in mind you want him to float). I gave mine a pair of googly eyes. Broken Drone? More like gonna make this balloon awesome with a broken drone. Scuttle-Puff was an afterthought. After breaking my ProtoX mini drone I cut off each motor, exposed all the traces on the pcb and put it back together so it would fit over this balloon that was sent to me by accident. Now, I've got an RC blimp that's much more fun to play with. While it does not get lift here in Colorado because of the altitude, it does scuttle around the floor kind of hilariously. A little compressed air can provide extended range of motion. For anyone interested, I recommend checking out the Soft Robotics Toolkit. They also host a competition using open source resources to design soft robots that perform a needed task or solve a problem in a novel way. There are a number of files available for download, case studies, and a bill of materials for the Fluidic Control Board, parts and equipment to get you started. 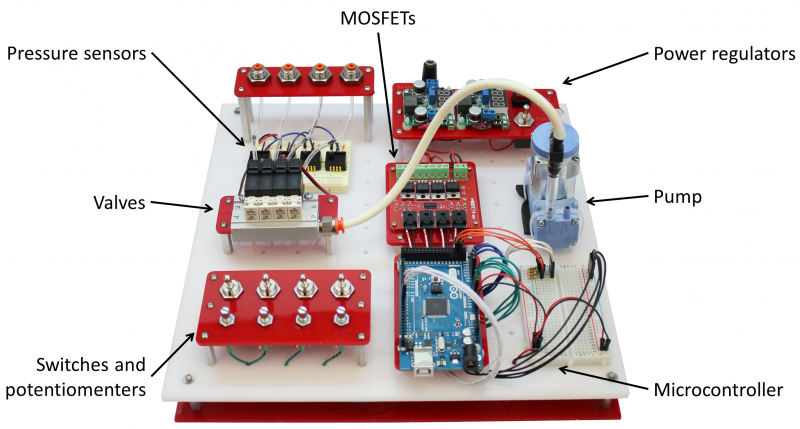 The Fluidic Control Board is automated through provided software running on an Arduino MEGA 2560. On board is a pump that provides the pressurized fluid of your choice to your system, some solenoid valves, power regulators, MOSFET power switches and, of course, pressure sensors, which are the heart of your feedback control system. Under the "Assembly" section, they even used a SparkFun tutorial to help you with the basic techniques of soldering. Sweet! 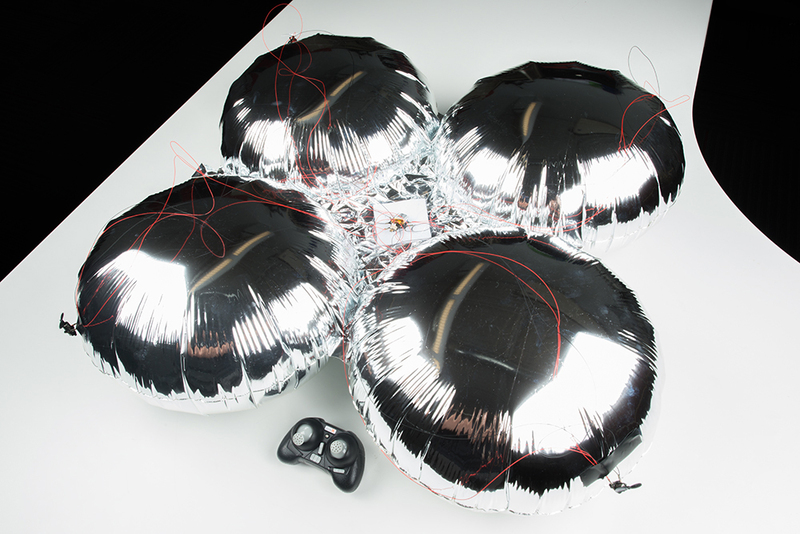 One of the winners of the Soft Robotics Competition in 2015 was this inflatable wheel. Since seeing this, my mind has been reeling with the possible applications. The video itself is unlisted, which is why I didn't include it, so please watch it on the Soft Robotics Toolkit website. Fire, freeze and weight tolerant while remaining cost effective -- it may save your life one day! Well, that was my first adventure into the inflating robotics. There's still plenty of room for improvement. And you didn't even see the failures. But it was fun, and I am inspired. I hope that soft robotics has spurred some inspiration and confidence in those who haven't yet played with robotics. It can be incredibly daunting to get into. I hope going soft at least helps you get your electronics fix while creatively solving problems. If anyone is interested in soft robotics and would like to see a similar version of the Fluidic Control Board at SparkFun let us know! The board mentioned has a price tag of just under $1K. Hopefully SparkFun could come up with something more affordable. I would like to see all of those things as well. Major motivation behind this post was see if anyone would be interested in offerings in Soft Robotics. I can see a scaled portable control board being made in the near future for a max personal cost of $40. We'll see what comes of it. Yeah, the Fluidic Control Board has several things that aren't "crucial" (e.g., pots, switches) and many that most readers already have (e.g., microcontroller, power regulator) or can deal with getting & setting up. If you actually do a board, I'd be inclined to include some valves, a pump, and the necessary "driver" hardware (so it can be operated by a Raspberry Pi, for instance). Measuring the pressure would be nice, but isn't crucial IMHO. I suspect that the valves alone are going to cost >$40 (for four), but $100 to $150 might be a realistic estimate. Wow! Fantastic timing! I've got an appointment with the "hand therapist" for some PT (officially "Physical Therapy", though sometimes "Pain and Torture" is more to the point!) on my wrist. I'll be sure to mention this stuff to her. Maybe 15 years ago, I toyed with the idea of doing an R/C "blimp" that could control buoyancy by means of strings/wires wrapped around the main part of the blimp and be able to compress or allow to expand the blimp, without releasing any of the gas from the bag. It never got beyond "thought experiment". Very cute! I'd love to check out the original Ollie as well but the link 404s. I would very much like to see more Soft Robotics on Sparkfun! I would also love to talk about this. This would make an interesting and fun lab. Let me know if I can help you design this.